The 2016 Writing Contest on Korean Culture is open to students K-12. Applications are due to the Korean Cultural Centre on 16 September 2016, with the winners announced at a special awards ceremony on 7 October 2016. For full details, including application from, please download the attached documents. For more information, contact the Korean Cultural Centre on 02 8267 3488. Teachers and students might be interested in this special Koran performance contest hosted by KEC. Huge prizes are waiting for 2015 winners e.g. A round-trip plane ticket to Seoul will be given to the First Prize for the Performance category in the High School division sponsored by "Asiana Airlines" in Sydney. See below for further information. Entries close on 31 October 2014. 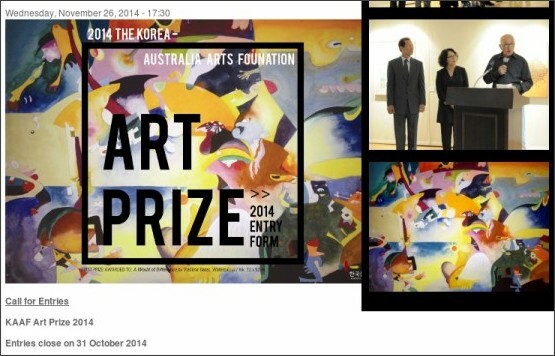 The Korea-Australia Arts Foundation Prize (KAAFP) is the annual art competition organised by the foundation. The KAAFP 2014 is open-themed and only medium of 2D works is eligible to apply for the competition. The prize entry is open to all Australian citizens or Australian permanent residents of at least 12 months, but they should be over 18-year-old. Last year at its inaugural prize, Vladimir Barac (Nowra, NSW) won the honourable first prize with 5,000 prize money. This year, the prizes come with better scales. The finalists’ works will be exhibited at the Korean Cultural Office Gallery which is located in the centre of Sydney CBD, 255 Elizabeth St, Sydney. The National Unification Advisory Council Australia invites you to take part in a video production competition. The competition is open to people of all ages living in Australia. An entry video clip (documentary, animation or short film) must be at least 3 minutes but less than 8 minutes in length, with a topic related to harmony, peace or unification of the Korean peninsula. Both English and Korean languages are permitted. Submission should be by 10 November 2014. The prize winners will be invited to the award ceremony and special screening night in early December. Congratulations! On behalf of the Korean Cultural Office, I am pleased to announce the winner of the 2014 Korean Book Review Competition. Please find the attachment of the winner of the 2014 Korean Book Review Competition. The Award Ceremony will be held on Wednesday, 27th August at 1:30 pm at the Korean Cultural Office. All winners need to come to the Korean Cultural Office by 12:30 pm for the rehearsal. Also we mostly welcome all teachers, winners' family members and friends to celebrate the award. We are glad and sincerely appreciate the participation of all students. If you have any inquires please do not hesitate to contact me. Congratulations to all participating students and winners. Hi. This is Jin from Korean Cultural Office. We are organizing a Bibimbab cooking competition on the 19th of July. The winner from Sydney will get the prize to enter the Grand Final competition in Korea (20th Sept - 1st Oct) with flight and accommodation provided. 2014 Korean Book Review Competition Due is on Friday 9 May 2014 . For more information, follow the link in the blog side bar. 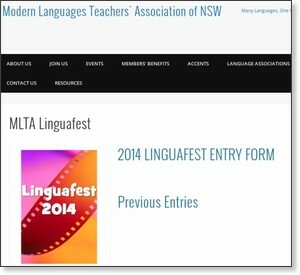 Students in Year 5 and 6, Years 7 and 8, and Years 9 and 10 are invited to participate in the 2014 MLTA of NSW Inc. Languages Competition. Students need to create and submit a short film, formatted as a AVI or MP4, (no more than 2 minutes in length) using the target language they are studying. The film should be based on the theme ‘Change’. Congratulations to all students and schools who entered the '2013 Korean Language Contest'. Thank you to 538 students who sent in their entries for this year’s competition. A very special thanks to the teachers who encourage their students to participate in the competition each year.